This post was originally published on facebook group NEET PG and DNB 2018 Counselling Aid and Update by Dr Chiranjeevi Nayak . It very well describes the unheard demand of lakhs of PG aspirants. The author has highlighted funny and illogical ironies of Indian medical education system and why most Indian doctors are going to grow weaker clinically in the coming years. Long post. Bear with me. Now coming to the entrance exam itself, NBE changes the pattern every year. No clinical questions at all! How does knowing about HaraKiri and the height a mosquito can fly to, help me in becoming a good doctor. Maybe it increases your GK. Why cant we have a USMLE based paper. Two exams, one part containing first 2 year subjects, conducted on one sunday and the next part next sunday having next 2 year subjects. With more clinical and decision making questions. But why take 1 month to declare results in the age of lightning fast Google search results? Next, the dilemma with different courses. DNB, MD/MS and Diploma. Why have Diploma at all? Whats the point? Why cant it be converted to MD. And DNB has low passing rate but is considered clinically a better degree? So why does everyone prefer MD? Because you can pass easily? Then why do most MDs do DNB post MD? Also, why are there MD courses in non clinicals in PG? Why are non clinical taught by doctors? (In developed countries, its usually taught by MSC PhD candidates who are more research and teaching oriented) Why not a nationalized degree? 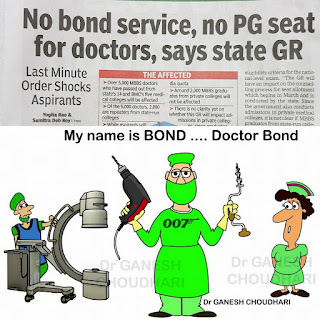 Why not have only clinical PG seats? Why doesnt the government keep equal number of seats in PG and UG. Why most PG seats in private colleges? America has more PG seats than UG seats. Also the training period being only 3 years for all MD courses? Just 3 years for Ortho and OBG? Every subject should be as long as the subjects course content and training requirement. (America has 5 year for OBG, 4 for Anesthesia etc) And why not Government sponsered PG course? Why ask the students to pay huge fees in private colleges? Rather they should be paid a stipend. Reservations! (Im a category student) Do we require it in Post Graduation? UG accepted. But specialty PG? Or at least Category students should be made to do extra rural service? Coaching institutes? I think it is more profitable in opening a coaching institute than being a super specialist. There are many more such problems. But be determined guys. If not this time, certainly next time. Keep working hard. You will succeed. DRACONIAN GOVERNMENT BONDS IN INDIA FOR GOVERNMENT MEDICAL SUPER SPECIALTY SEATS: 10 YEARS OR RS 2 CRORE!